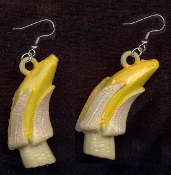 Huge Vintage BANANA PEEL EARRINGS - Funky Retro Junk Food Snack, Novelty Charm Jewelry - BIG realistic, 3-D Plastic toy, gumball vending machine charms, approx. 1-3/4" long x 3/4" wide. This would make a very a-PEEL-ing gift for monkey collectors!